This poem was written on the spot at a recent event at my daughter’s school, where the students presented their explorations on themes of social inequality and discrimination to the assembled masses. As at most things I go to these days, there was a sausage sizzle. As a vegetarian, I feel somewhat redundant at these things, even where vego items are provided. All weak and salady and wilting. But give me something to write on, and I’ll write. I recently saw a wonderful poet who composed a much more impressive and less sausagey poem on the spot, based on words called out from the audience. Khairani Barokka, known as “Okka”, is an Indonesian writer, performer, artist, producer and researcher. 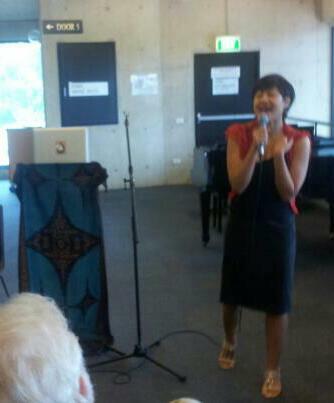 She is definitely one of the most exciting performance poets I have ever seen, and her appearance at the ANU School of Music, organised by the group of poets who meet there and by Australian Poetry Limited, was something I will remember for a long time. Particularly her poem about being asked to rate pain on a scale of 1 to 10. She combines the highly personal and historical and political aspects in her work, without any of the seams showing. Here she is at the recent Canberra performance. Not the best photo, but I’ll blame Okka for not standing still! Local poets also read their work, and Indonesian Butet Manurung spoke about her experiences with marginalised jungle-dwelling people in Indonesia. She read from her non-fiction book The Jungle School. The book is already available, but will be launched in Australia and New Zealand next year. All round, it was an exciting event. And not a sausage to be seen. Or smelt! Click this feather for further poems. Go on. Click like a clicky thing. Though I do like it, truth be told. I like it too! And the description beneath is fascinating. I think of myself as “a poet who likes to perform”, yet I would never describe myself as a “performance poet”, and the distinction niggles at me. Maybe, if I went to more performance poetry events, I could figure it out. Sometimes I think the distinction is just whether one has a piece of paper in front of one or not. And whether there is scoring. Although, there wasn’t any of that at this event, of course. Glad you liked the post Tim, and that it inspired you to post your one and only haiku. Well you would have to win the prize for the title. 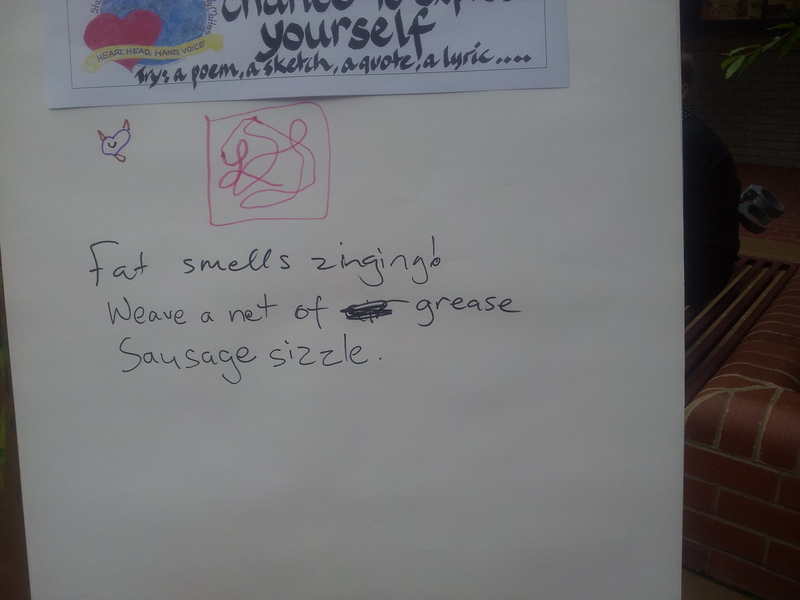 For a vegetarian to find poetry in a sausage…Wow! So many puns spring to mind, like tumescence itself. But I’ll keep it mildly saucy, not too explicit. Glad you liked the title, Helen.